I blogged last week on the founding in 1588 of the little Alms House run by Saviour’s Church, Cure’s College, on Maid Lane in Southwark, where the Rose, Globe and finally Hope theatres stood, by the Stewes and the river. Parish Gardens, that centre of theatre, brothels and bear-baiting, was nicknamed ‘The Bear College”. I also said that the draconian rules for those 16 local poor folk, men and women, laid down by that saddler to Queen Elizabeth, Thomas Cure, were a forewarning of the dreaded Workhouses to come, that Dickens so pilloried in novels like Oliver Twist. I’m certainly convinced that the shape of modern Capitalism and many of the woes we face today were born in Tudor London. In that privatisation of Church land called The Reformation, but most especially in the explosion of Private enterprise from the walled City, that turned the old English idea of Empire, lost in France, into an Empire of trade around the World. So the East India Company was founded in the same year the little wooden Globe theatre went up, 1599, and in 1605, I think, the Virginia Bay Companies too, that led the expansion in the Americas and the race, especially with the Dutch, for brave new worlds. The East India Company would of course define British power and Foreign Policy for Centuries, owning private armies and putting up their first little fort in Madras in 1607, the year Shakespeare’s brother Edmund died and was buried in Southwark. That same year there is a record of Hamlet being performed on board an East Indian ship, The Red Dragon, off the coast of Sierra Leone. It was formerly a warship called The Spirit of Malice and is mentioned in AL Rowse’s book on the astrologer Simon Foreman. 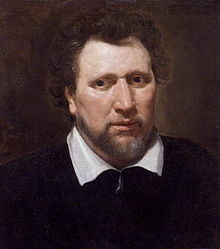 The echoes of such a dynamic time are all over Shakespeare, of course in The Tempest, but also in Falstaff’s descriptions of himself in The Merry Wives of Windsor, in terms of Continents and Countries. Then there is that strange, almost unintelligible dedication on the cover of the sonnets about ‘well wishing adventurers’ setting forth. Those vital player’s patrons The Herbert brothers were of course major share holders in those City Companies, as the idea of sharers and private enterprise is also reflected in Shakespeare’s own theatrical Company, whose leading members had fingers in several little business pies in London, like groceries and sea-coal. In 1612 the first ‘Free Standing Lotterie’ was launched in the city too, to fund New World endeavours, and from common purses too, which all 13 original American colonies would soon take up. I’ve said before they were remarkably early origins then to that so-called ‘American Dream’ (and Shakespeare is filled with dreaming) born in London and the City. It was of course all about trade but also private banking and ownership, along with the massively lucrative beer trade, that in terms of private wealth remains true to this day. Meanwhile, although Elizabethan ‘social security’ nets were remarkably fragile, they were there, in Parish organisation, although with the often hypocritical and allied hands of Church and State control. Take the unconsecrated graves of prostitutes and the poor at ‘Crossbones’ in Southwark. While there is that telling note in one of the St Saviour’s Records, of a payment ‘to send a woman out of the parish’, as Wards tried to deal with the growing issue of the Urban Poor in London and to fob it off on neighbouring parishes. In the meantime much of the condition South of the River grew into a true nightmare, with places like the Marshalsea Prison on Long Southwark, but also those Liberties themselves, areas of independent jurisdiction, that also spawned Crime, prostitution and slums like ‘The Rookeries’, where Daniel Defoe sets much of Moll Flanders. Despite all our worries then about Banking scandals today and the inequality of rules and playing fields, it was probably only the changing of the laws of debt in the 19th Century that saw true social reform. It is also true that the one old photo I have seen of Cure’s College, by the time it had developed into a stone structure by the early 19th Century, is very forbidding indeed. Yet I got a fascinating insight into modern Alms Houses the other day when I helped a friend move rooms at the oldest Alms House in England, in Winchester, at The Hospital St. Cross and The Order of Noble Poverty. Of course the links with Winchester and Southwark were very strong indeed. It is very doubtful that poverty was ever considered especially noble in England, outside the beliefs and Orders of sections of the Church, but it is a charming and very historic place, rather like an Oxford College, and dominated by a huge Norman stone Church. It boasts the title of the oldest charitable institution in England. Incidentally scenes from the brilliant Wolf Hall, now running on the BBC, were shot here. It’s a pity I didn’t get to bump into Mark Rylance then and ask such a fantastic actor and former Artistic Director at the modern Globe why he believes the silly and impossible theory that Shakespeare was the Earl of Oxford. It just happens to be that the beneficiaries at St Cross today are all men, and refer to one another as ‘Brothers’, while at Cure’s College there were certainly men, women and children too. You do not have to be of any Religion, I believe, and Cure’s founding document specifically laid down that members had to be of a Protestant faith, though the Brothers today are required to attend Matins in the Church in their red robes. But in return they have charming rooms, peace and quiet, friendship and excellent and highly subsidised lunches too. They are not, as the poor of Cure’s College certainly were, required to work for their bed and board. I didn’t see around the whole place, like The 100’s Hall where a hundred locals were fed regularly, and my dog Rascal upset the ordered tranquility a little when we wandered into the Garden, but that and other Alms Houses in Winchester and around England are a testament to an ancient and noble tradition. 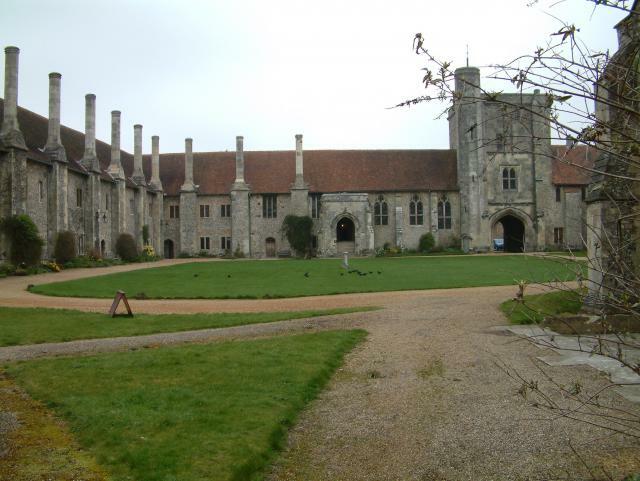 The photo shows the main Courtyard of St Cross,medieval but edged by an original Tudor balcony.